During 2012, our blog has reflected on the Berenstain Bears and their creators Jan, Stan, and Mike Berenstain as they marked their 50th Anniversary. It has been fun to look back through all those years of art files and reminisce about the many, many adventures the Berenstain Bears have had down a sunny dirt road in Bear Country. It was also a very difficult year, as we lost our dear Jan in February. In reviewing the files, the very first Berenstain Bear sketch was found, as well as the art work that led up to the first Berenstain Bears’ book – The Big Honey Hunt. This title was published in 1962 as part of Random House’s Beginner Books series with editor Ted Geisel (aka Dr. Seuss). Finding the lost manuscript for what was originally written to be the second book in this series – Nothing Ever Happens at the South Pole – and seeing it published during the 50th year was very special for Jan. She took great delight in bringing the early sketches from the manuscript to life. 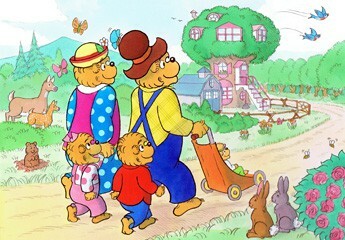 The early readers were followed by the First Time Reader series, the first of which was The Berenstain Bears and the New Baby, published in 1974. It was interesting to discover that many children, now-grown-up from the 1980s had no idea our sweet little Honey was born in The Berenstain Bears and Baby Makes Five in 2000. To celebrate our very special anniversary, HarperCollins Children’s Books and Random House Children’s Books worked with Jan and Mike to document the creation of the Berenstain Bears. These phenomenal interviews were filmed just 3 weeks before Jan’s death. If you haven’t had time to watch the five short video interviews, you can find them on the video link on the Berenstain-ology tab of the Parents Den on our website. A question we are often asked arises from the perception that at this point in our lives, we could easily retire. The comment usually runs along the following lines: “I know what I would do if I were in your position. I’d retire and travel.” The answer to that question is twofold. Why in the world would we retire? We thrive on what we do and we’re going to keep on doing it, we say (only partially tongue in cheek), until we get it wrong. As for travel–we do travel. Extensively. We go to a lovely, salubrious place where honeybees hum, where rainbow trout march rainbow skies, where the rivers run clean and the air is sweet, where there’s beauty around every bend in the sunny dirt road. It’s a wonderful place. It’s called Bear Country. We go there every day.